"Strong is the ultimate guide to dreaming big and reaching your goals ―whether that's qualifying for the Boston Marathon or scoring the big promotion at work." 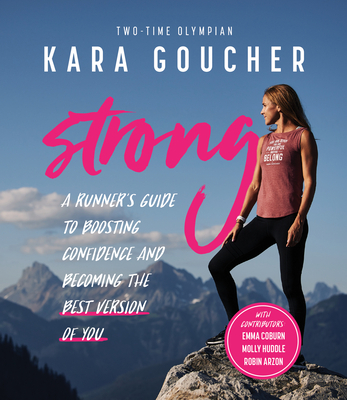 Two-time Olympian, Kara Goucher, shares her secrets to conquering self-doubt and improving running performance using proven tools from the field of sport psychology. Strong: A Runner's Guide to Boosting Confidence and Becoming the Best Version of You includes tips, techniques, and real-life experiences from Olympians Emma Coburn and Molly Huddle, and New York Times best- selling author Robin Arz n. Strong also offers perspectives from two experts in the field of sport psychology, including Kara's own sport psychologist, Dr. Stephen Walker. Kara's stories, experiences, and glimpses inside her personal confidence journal. Insights from inspiring women in the field of running. Guided activities to incorporate eight confidence techniques into your own training, including: Positive Self Talk, Mantra, Setting Goals, Enclothed Cognition, Power Pose, Visualization Techniques, Power Words, and Social Connections. Tools to starting your own Kara-style confidence journal, with over 25 prompts to get you started. Running is a head game. There are two options: Let your mind wander, or focus. To compete, you must focus. "Mental conditioning is an important part of an athlete's training regimen. Winning and losing are more a matter of mental preparation and toughness."